Revert2Islamtoday is a blog whose main objective is to share Information about Islam, Qur'an and prophets Sunnah. It also shares the new Muslims journey to Islam to both Muslims and not yet Muslims. 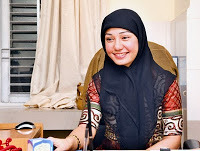 Nepal's famous actress/model 28-year-old Pooja Lama’s conversion to Islam has surprised many in Nepal and India. She was brought up in Buddhist family, She announced her Conversion after a short visit to Dubai and Qatar. Q: What persuaded you to accept Islam? A: I was from the Buddhist family, One year ago Decided to study other religions, Hinduism, Christianity and Islam and started a comparative study. During study, I traveled to Dubai and Qatar and was impressed o see to see the Islamic civilization. The best thing about Islam is the Oneness, faith and trust in Allah, strong belief, which I did not see in other religions. Q: World media has opened aggressive front against Islam, Islam is being presented in the style of terrorism, were you not affected by it? A: Propaganda against Islam is one of the reasons for me to embrace Islam, because what they say is different from what I found and now I can say with the claim that Islam is the world's only religion of humanity and peace issues Justice Solution offers. Q: Pooja Ji!, the film industry is concerned about you and your many previous scandals in the media and once attempted suicide as well, will tell us something? A: I do not want to accuse the media regarding my personal life to publish negative comments, to defame me, I think it is business for them, as I have been married thrice. I have a son from first husband who lives with my mother, The in order to sell write improper things, which hurt me very much, people accuse me that I did it for fame What's all this? The truth is that I was miserable and wanted to commit suicide, I took my friends, led by the study of religious books, then embraced Islam, I want to forget my past, because I am now quiet happy and lead a decent life. Q: Pooja Ji! After acceptance of Islam came a major change in your lifestyle, your wear Scarf (hijab), do not take alcohol and or smoke. Do you repent? A: Please don’t call me Pooja, Pooja is my past and now I am Amna Farooqi. I had unhappy and tension-filled moments before Islam. Alcohol and cigarettes were my support. I used to get so drunk and at times used to get unconscious. I was a Prey to depression and the darkness around me was just dark, but the joy of Islam has helped me to abstain from alcohol and cigarettes. Now I only do halal things and eat, drink halal. Q: What were the motives of Islam? A: Since some of my Buddhist friends had converted to Islam, when they saw me unhappy, they introduced me to Islam, explain its teachings, I started to read, one day I attended a Muslim friends lecture, It opened my heart and was not any longer afraid of any human being but only Allah, so I embrace Islam at that time. Q: After acceptance of Islam what was the reaction of your family? A: After embracing Islam I informed my family, who lives in Darjeeling, India, my mother cooperated fully, My family say :''Oh dear! You have chosen the right path, to see you happy, we are happy. I am a changed person and have got rid of all bad habits, So even my family has seen this change in me for better and are very happy about it. Q: The media have expressed that you have fallen in love with a Muslim man and have got married, hence you have converted to Islam. Is it true? A: baseless news, Some my friends are Muslims, but this does not mean that I have fallen in love with someone and have converted for marriage But, yes now that I am a Muslim, so I will marry a Muslim in future. Whenever I decide to marry I will let everyone will know. nice GOD leads her in the path in which GOD becomes happy on her. :) she will get tranquility in life. Alhamdulilla. may Allah bless u. helps u.
Alhamdulilla. may Allah bless u. helps u. if u need any help I'LL try to do my best. I'm not handsome, but I can give my hand to someone for help.